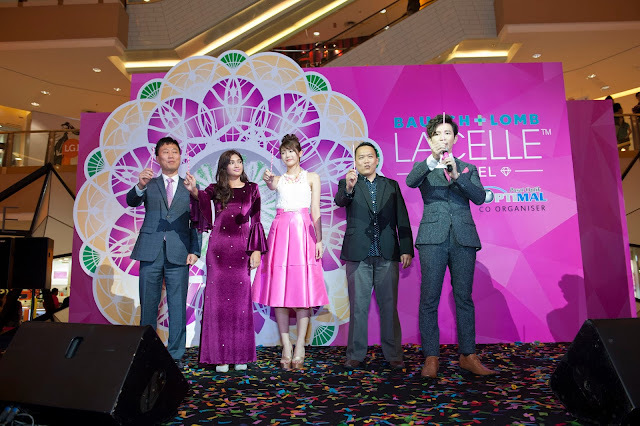 A few weeks back I was invited to the official launch of the Bausch + Lomb Lacelle™ Jewel, a monthly disposable coloured contact lens which made its first appearance in Asia. Scroll on past the jump for some pictures on the event and more information about this contact lens! What is Bausch + Lomb Lacelle™ Jewel? According to Bausch + Lomb, Lacelle™ Jewel has a unique lens design that enhances lens centration. Due to the thin lens design with a centre thickness of 0.078mm, the contact lens wearer experiences great comfort. This lens material with a water content of 38% also minimises protein uptake from tears and provides hygiene and ease of lens wearing. 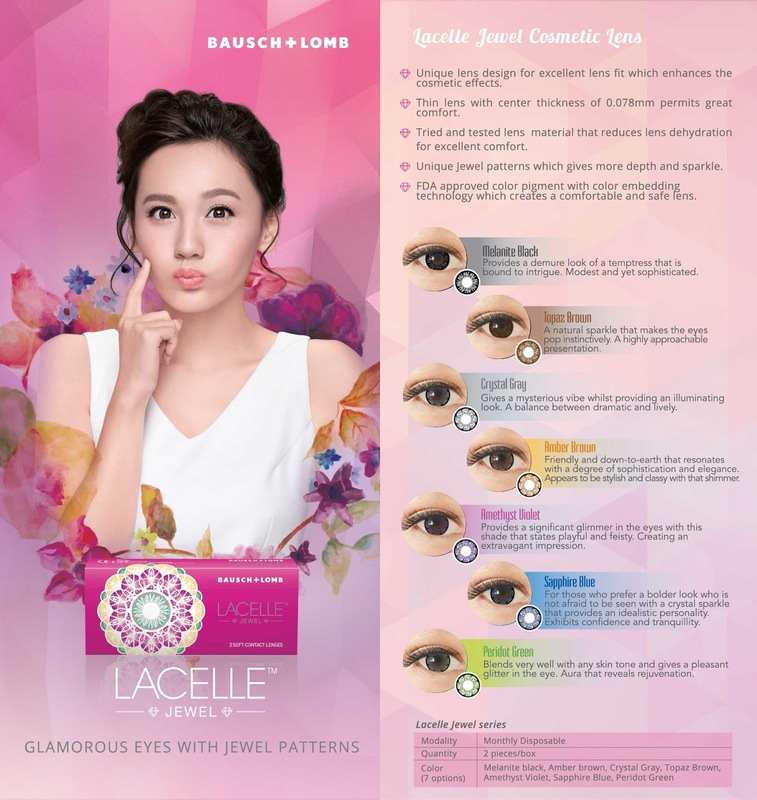 Bausch + Lomb claims that the jewel pattern design of Lacelle™ Jewel gives more depth and sparkle to the eyes, darkens and enlarges the iris to portray naturally bigger eyes. The result of wearing Lacelle™ Jewel is that it will make the eyes distinctive and bright, leaving the eyes looking naturally coloured rather than artificial. Melanite Black - Provides a demure look of a temptress that is bound to intrigue. Modest and yet sophisticated. Topaz Brown - A natural sparkle that makes the eyes pop instinctively. A highly approachable presentation. Crystal Gray - Gives a mysterious vibe whilst providing an illuminating look. A balance between dramatic and lively. Amber Brown - Friendly and down-to-earth that resonates with a degree of sophistication and elegance. Appears to be stylish and classy with that shimmer. Amethyst Violet - Provides a significant glimmer in the eyes with this shade that states playful and feisty. Creating an extravagant impression. Sapphire Blue - For those who prefer a bolder look who is not afraid to be seen with a crystal sparkle that provides an idealistic personality. Exhibits confidence and tranquility. Peridot Green - Blends very well with any skin tone and gives a pleasant glitter in the eye. Aura that reveals rejuvenation. The lens claims to contain pigment standards which is authenticated and certified by the FDA which creates comfortable and safe lenses to wear. 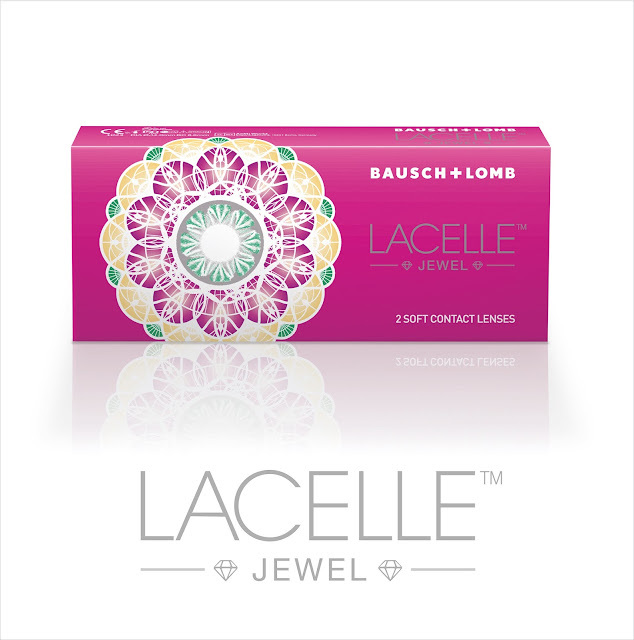 Bausch + Lomb also claim that these lenses have shown to be non-toxic and non-irritant to the eyes as Lacelle™ Jewel practices safe colour additives. Sounds good to me! Also, if you are short-sighted (like myself), don't fret as these come in a variety of different powers (not sure what is the maximum power, though). However, I believe these lenses do not cater for astigmatism, which is a little unfortunate as these are quite pretty. 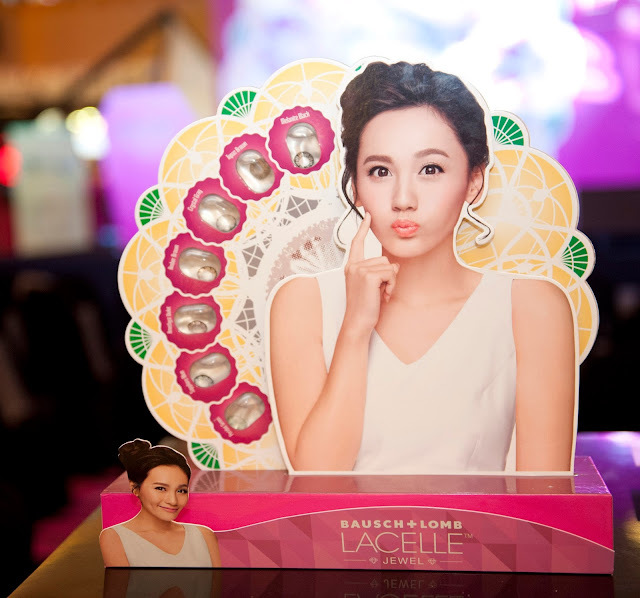 Lacelle™ Jewel retails at RM68 per box (2 monthly disposable soft contact lens per box) and is available at all major optical dealers. It is a new line extension to the current Bausch + Lomb Lacelle™ and Lacelle™ Colours ranges. Twenty-something ♥ makeup & skincare addict ♥ Romantic comedy buff ♥ Red bean lover ♥ Banana yoghurt/ice cream fan ♥ Loves bright, cute & colourful things ♥ Pug & Lhasa Apso lover ♥ Self-professed Gleek ♥ Check out my 'About Me' tab for more details about me! Blog header design & 'Contact Me' image credit to Kevin Ching. Copyright © 2018 Beautee Beauty. Powered by Blogger.